Hi, I am Brenda Ginsberg, and I've been selling vintage and antique jewelry on the internet since 1998. My passion is for beautiful, superbly made antique items. I sell fine jewelry including vintage and antique earrings, rings, necklaces, pendants, lockets, bracelets, bangles and brooches. I also look for vintage and antique men's jewelry including cufflinks and dress sets. I sell some rare and special antique and vintage silver and objects of virtue, especially useful items that you can incorporate into your fine dining. I look for quality, workmanship, and rarity and scour the globe for vintage and antique jewels that peak my curiosity and satisfy my regard for quality. I see antiques as a link with the past! Think of the many generations of people who earned, looked after, and cherished these beautiful antique items. Who wore this pair of vintage earrings? I also think that besides being a luxury, and a privilege to own, it is our responsibility to ensure that they are passed down to future generations—whether in our family, or others. We have a vast, and still growing, reference library that we use to research, catalog and describe the antique jewelry and antique silver we have for sale on our website. Each antique or designer named jewel on our website is carefully described and pictured from a variety of angles so that you may get a clear idea of what it would be like if you were holding it in your hands. We do our best to call any flaws. Our prices are more than fair. Great service is an important part of what we offer to our customers. 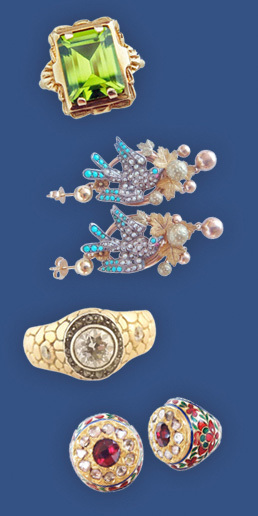 We have a professional packer and shipping staff to ensure that you will receive your valuable antique jewelry in the same fine condition that you saw it on-line. Communication is the key to a successful transaction! Asking plenty of questions before the transaction will go a long way in ensuring that you are satisfied with your purchase.